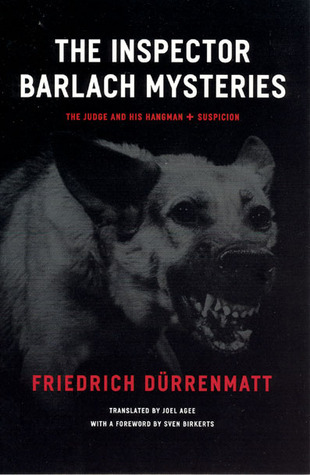 Inspector Barlach is an old detective who has returned to his native Bern after living for years abroad in Constantinople. His heart is failing him, and he knows that he has about a year left of his life. In the Judge and His Hangman, a police officer has been found dead and Barlach is on the case. The case leads him to his nemesis who once committed a murder in broad daylight with Barlach as a witness and still managed to get away with it. And Barlach solves this case in an extraordinary way. In Suspicion Barlach has had his heart surgery and is hospitalised when one of the doctors recognises a nazi doctor, Nehle, who is performing surgeries in a concentration camp on a photo in Life magazine. The doctor says to Barlach that Nehle looks exactly like an acquaintance of him, Emmentaler, who went to Chile before the war. Barlach doesn’t think this is a coincidence and decides to check out the case. These stories are about 100 pages each, and while the Judge and His Hangman is simply too short to explain everything properly, Suspicion is perfection. In the Judge and His Hangman I felt that too much were left out and that the solving of the case was difficult to follow. I’m surprised that it is this story that is on the 1001 list and not Suspicion. I definitely liked Suspicion better and there are some really great characters in that one. I want to read the final Inspector Barlach mystery; the Pledge. the Judge and His Hangman was March’s read in Line’s 1001 books challenge.